The Charities (Protection and Social Investment) Act 2016 gives the Charity Commission new powers to remove and disqualify people from acting as trustees or working in the senior management of a charity. In the Summer of 2016 the Charity Commission issued a paper which elaborated on how it will use its new powers, the process through which it would determine whether a trustee should be removed, and the limitations to that power. DSC responded to this consultation, raising concerns that wording in many areas is unclear and open to interpretation. 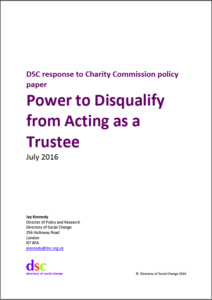 DSC reiterated its concerns relating to removing a trustee who has ‘damaged public trust and confidence in charities’ because of the inherent difficulty in determining what constitutes damage.